One hundred years ago, a large emergency shipbuilding programme was underway right across the United States of America from the West Coast to the Great Lakes and the East Coast. The Congress of the United States of America voted to declare war against Germany on 6th April 1917, after many American ships had been sunk in the ‘declaration of unrestricted total submarine warfare and a sink on sight’ policy by Germany at the beginning of 1917. The U-boat terror claimed over 1.685 million tons deadweight of Allied ships in the first three months of 1917, around 700 ships sent to the bottom. The first American citizens had been lost in the sinking of the Cunard liner Lusitania in 1915, and now America had suffered more than enough of the German war machine, and the time for this great nation to retaliate was at hand. The prospect of millions of American G.I.s being sent to France to fight in the U.S. Army Meuse and Argonne campaigns, and being supplied by American cargo ships with food, ammunition, weapons and stores, called for a massive shipbuilding effort. The United States Shipping Board (USSB) formed the Emergency Fleet Corporation (EFC) with huge amounts of capital to build over 1,800 standard ships in American yards. During the first six months of 1917, yards in the U.S.A. and other yards in the Far East produced 1.333 million tonnes deadweight of ships for the American war effort. A massive organisational and planning operation was underway to produce during 1918 and 1919 a colossal number of over 1,850 ships as the war was not expected to be over until 1920. Many designs were produced by American yards, with design numbers 1013, 1019, 1066, 1080 and 1133 producing around two hundred ships from West Coast shipbuilders, and given ‘West’ or ‘Western’ prefixes to their names. These engines ‘midships cargo ships averaged 5,600 grt and 8,600 to 8,800 dwt, with the ‘West’ versions being triple expansion steam engine propelled and the ‘Western’ versions being steam turbine propelled. The most numerous types in the new fleet were around four hundred engines ‘midships coastal cargo ships produced to seven designs by shipbuilders on the Great Lakes and thus given ‘Lake’ prefixes to their names. These ships averaged 2,500 to 2,700 grt and 3,400 to 3,800 dwt, and could be used in British coastal convoys if they survived their once only voyage across the U-boat infested waters of the North Atlantic. 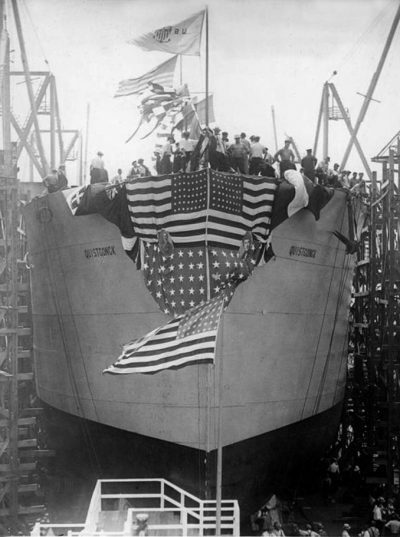 An indication of the scale of this American shipbuilding effort can be gauged from the astonishing spectacle of 94 steel and wooden hulls launched from yards all across America on Independence Day, 4th July 1918, all in one day! Three new yards were also under construction or in operation at this time, with these new yards solely engaged in assembly work with components produced across America and brought by rail to the ‘Hog Island’ yard of the American International Shipbuilding Corporation (AISC) on the banks of Schuylkill river at Philadelphia, and also to a yard at Harriman in Pennsylvania and another yard at Newark Bay in New Jersey. The launch of the 5,144grt Quistconck by the American International Shipbuilding Corporation. In 1941 she joined the British Government as Empire Falcon and in 1946 she moved to Rowland & Marwood’s SS Co. as Barnby. In 1952 she became Mariandrea of Soc de Nav Magliveras. On 3rd March 1953 she arrived at Troon to be broken up by West of Scotland Shipbreaking Co. The rise of Philadelphia to become the most important city in Pennsylvania is due to two men, William Penn (1644-1718), an English Quaker, and Benjamin Franklin (1706-1790) one of the Founding Fathers of the United States of America. Penn founded the city in 1682 as an experiment along ‘Quaker lines’ and the future capital of Pennsylvania Colony. Pennsylvania Colony had been named by Charles II of England after his dead friend, Admiral Penn, the father of the founder of Philadelphia. Franklin was born in Boston, but came to Philadelphia as a young man to establish a printing business and run a newspaper, the Pennsylvania Gazette. His work that advanced electrical science was awarded by two Honorary Doctorates from St. Andrew’s University in 1759 and from Oxford University in 1762. Philadelphia was a meeting place for the Founding Fathers of the United States of America, who signed the Declaration of Independence in 1776 and the Constitution in 1777. English colonies had also been founded in Maryland (Terra Mariae) and Virginia (Terra Virginiae), which also wanted their independence from the English Crown. On the eve of the American Revolution against the British in 1775, the population of Philadelphia had grown to 21,500, the name of the city having come from the Greek for the ‘City of Brotherly Love’. After independence was granted to the new country, Independence Hall was built in the city with the preserved Liberty Bell from the Revolution on display in the green area outside Independence Hall. Philadelphia sent two companies of the Washington Grays volunteer soldiers in May 1861 to Washington (DC) at the start of the Civil War to help the Union side in the battles with the Confederates. The American Centennial Exhibition opened in Philadelphia on 10th May 1876 on a site covering 236 acres. The steel and glass Main Exhibition Hall was the largest building in the world at the time of its construction, and was made of steel from local Carnegie steel plants. Bethlehem Steel was incorporated on 10th December 1904 in Philadelphia after the nucleus of the company opened for business a year earlier. Charles M. Schwab, a former U.S. Steel President, purchased an interest in the small Bethlehem Steel Company, and was made President of all Bethlehem Steel activities and he began to use the Bessemer process to manufacture steel in Pittsburgh, the other great city of Pennsylvania 350 miles away from Philadelphia. Philadelphia has thus had traditional industries such as shipbuilding, locomotives, manufacturing, oil refining, carpets, woollens, cottons, worsteds and sugar processing for over a century. A site for the new Hog Island emergency shipyard was chosen between the Schuylkill (pronounced ‘School-kill’) river in the west and the Delaware river in the east and opposite the Philadelphia Naval Yard for no fewer than fifty building berths, seven wet docks and a fitting out basin. The yard was an assembly plant, using prefabricated parts and sub-assemblies produced by dozens of subcontractors, thus it was the first yard in the world to use modern prefabrication methods instead of traditional methods of building ships. The site today is that of Philadelphia International Airport, and the end of the slipways can still be seen protruding from the banks of the airport. It was planned to build 180 ships here to two designs, cargo ships to the 1022 design and troop transports to the 1024 design. However, 58 ships were cancelled after the end of the war, resulting in 110 cargo ships to the 1022 design, and a dozen troop transports to the 1024 design leaving the yard by the time the last ship was completed in January 1921.